Died: 22nd August 1918; age 32; KiA. Regiment: Cambridgeshire Regiment, 1st Battalion. 1891 Mill Road, Aldringham, Suffolk. John Adams, 49, Agricultural Labourer, born Sibton, Suffolk. Sarah Adams (nee Gardiner), 49, born Weybread, Suffolk. William Adams, 23, a Bricklayer, born Yoxford, Suffolk. Jane Adams, 22, General Domestic Servant, born Yoxford. Henry William Adams, 19, a Groom/Gardener, born Yoxford. George Adams, 15, a Tailor’s Assistant, born Yoxford. Robert Adams, 13, a Painter’s Assistant, born Aldringham. Clementina Adams, 9, born Aldringham. Ernest was 14 years old, a Painter & Plumber. He was living with his parents & brother. John, 59, a Wood Yard Labourer. 1911 54, Sirdar Villas, Leiston, Suffolk. Ernest was 24 years old, a Painter of Agricultural Implements – Engineering Works. He was living with his brother, sister-in-law & niece. Robert, 33, a Painter of Agricultural Implements – Engineering Works. In 1915, Aldringham, Suffolk, Ernest married Amelia Maria Botwright, 1888, Aldringham, Suffolk. They lived in Ipswich. 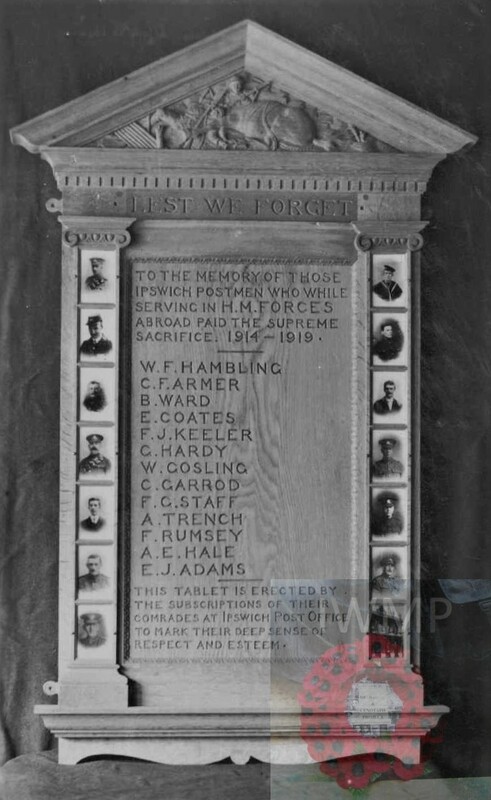 Ernest is also remembered on the Aldringham Baptist Burial Ground War Memorial, Aldringham, Suffolk and on the war memorial at the Royal Mail Centre, Commercial Road, Ipswich.